Method 1: FirstGlance Can Save Static Images: Easiest, any size, high quality automatically. Method 2: Capture A Screenshot. Method 3: Static Image from Polyview-3D. Method 1: FirstGlance Can Save Presentation-Ready Animations. Method 2: Make A Presentation-Ready Animation with Polyview-3D. Method 3: Project FirstGlance Itself. Browser Compatibility for Saving Images and Animations from FirstGlance. It is easy to put any molecular view from FirstGlance in Jmol into a presentation or document (Microsoft Powerpoint or Word, Google Slides or Docs, Libre Office). Method 1: FirstGlance Can Save Static Images. Automatically saved in high-quality mode regardless of Quality button in FirstGlance. Image defaults to the size of JSmol, but can be set larger (or smaller): 50 to 5,000 pixels. If you can see the molecule, you can capture an image (from any website, any browser, using Java or not). Works from Proteopedia.Org, where molecular scenes can be customized. You might forget to depress the Quality button in FirstGlance before capturing. Image cannot be larger than your screen, or smaller than the browser will go. Depress the Quality button (near the Spin button) in FirstGlance in Jmol. In Proteopedia, use the Toggle Quality button below the molecule. Also you may want to use the popup button to make a larger (resizable) image before capture. MS Windows (7 and later) include a convenient screenshot tool called Snip or Snipping Tool. Click Start, then type snip in the search slot in the Start Menu. The rest is self-explanatory. But here are instructions. MS Windows XP or earlier: Alt-PrtSc (hold down the Alt key, then press the Print Screen key) copies the active window to the clipboard. You can then paste the image into another application (such as Powerpoint). Cropping an image pasted into MS Powerpoint or MS Word: After you paste the image into an MS Powerpoint slide or MS Word document, click on the pasted image. A "Picture" toolbar will appear. It includes a cropping tool: click on to activate cropping. Edge markers will appear on your pasted image. Drag these to delimit the new cropped image. Click the cropping tool again to de-activate it. Now you can resize the image (with the corner handles) and drag it to the desired position. Clipboard: Hold down Command (Apple) plus Shift plus Control (yes, 3 keys all at once! ), and then press the "4" key. Now, use your mouse to click and drag a rectangle around what you want to save. When you release the mouse, the image will be saved to the OS X Clipboard. Now you can paste it into Word, Powerpoint, etc. Saving an Image File: Hold down Command (Apple) plus Shift (just 2 keys), and then press the "4" key. Now, use your mouse to click and drag a rectangle around what you want to save. When you release the mouse, the image will be saved directly to a disk file (in Portable Network Graphics or .png format) on your desktop. This file can be displayed in a web browser, inserted into a Powerpoint slide, etc. You can customize rendering and coloring. Image will be best publication quality, created by PyMOL. Image can be any size. Not as easy. Involves learning a new set of controls for rendering and coloring. Many views in FirstGlance are not easily obtained in Polyview-3D (and vice versa). Extremely easy to make from FirstGlance. Can rock back and forth, or spin 360°, around the Y or X axis. In most cases, takes only 1-3 minutes to generate the multi-GIF animation file. FirstGlance can animate customized molecular scenes from Proteopedia.Org. Instructions. Cannot animate morphs or complex transitions. Can only rock or spin a single molecular scene. Method 2: Presentation-Ready Animations from Polyview-3D. Powerpoint-ready animation made with Polyview-3D. Click animation to ENLARGE. You can customize rendering and coloring. In contrast, FirstGlance offers a limited set of canned renderings and color schemes. Images are higher quality than images/animations from FirstGlance. This is because Polyview-3D generates images using PyMOL. Morphs can be animated in addition to rocking or spinning. See example in the last slide of the demonstration set linked above. Involves learning a new, but easy, interface. You must generate the desired molecular scene using the controls at Polyview-3D. You cannot import a scene from FirstGlance into Polyview-3D. Once you submit your animation request to Polyview-3D, you may have to wait an hour (sometimes more) for the file to be generated, especially for larger animations with smooth rotation. After the completed animation appears in the browser, right-click and Save Image As. Drag and drop the saved GIF file into your Powerpoint® slide. ConSurf: Polyview-3D can also make static or rotating views colored from ConSurf results. One slide in the demostration slides linked above shows a protein colored by evolutionary conservation with ConSurf. At your ConSurf results page, download the PDB file with ConSurf conservation grades in the temperature field. At Polyview-3D, under Source of Structural Data, use the Choose File button to upload your ConSurf PDB file. Under Advanced Structure Annotation, check Functional regions from ConSurf. You may use the Image Settings (for example to make a larger image) and the Animation Settings (for example to make the molecule rock back and forth in a Powerpoint slide). Click Submit to obtain your result. Rotating Views Method 3: Run FirstGlance during your presentation. Running FirstGlance during your presentation is a powerful method for including rotatable, molecular views in a presentation. If most of your presentation is in Powerpoint, you would need to pop the FirstGlance browser window in front to show rotating molecular views, then pop Powerpoint back in front afterwards. This method requires a reliable Internet connection when projecting your presentation. ConSurf, Pepitope, or Selecton results: Consider downloading your ConSurf/Pepitope/Selecton result so you can guarantee that you have it, even it it gets removed from the server before your presentation. With this method, you can show a ConSurf/Pepitope/Selecton result exactly as it was first shown to you by the server. You will need an Internet connection to upload the saved file into FirstGlance. Rotating Views Method 4: Proteopedia. At Proteopedia.Org, you can create online customized interactive molecular scenes in Jmol, complete with descriptive text, and green links that display several different molecular scenes. The molecular scenes can be taken directly from FirstGlance in Jmol, following these instructions. One big advantage of creating molecular scenes in Proteopedia is that they are immediately online for everyone to see and share. Normal pages in Proteopedia can be edited by anyone (as they can be in Wikipedia). However, you can make protected pages in Proteopedia that only you can change. See Help:Protected Pages. Another big advantage of creating molecular scenes in Proteopedia is that they are truly interactive -- they can be rotated and zoomed. 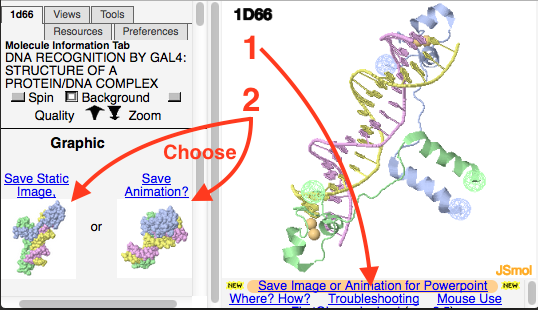 A third big advantage of showing molecular scenes in Proteopedia is the popup button under every molecular scene. This opens a new, resizable window containing only Jmol with the molecular scene. You can make it as large as you want, then rotate or zoom it. ConSurf results can be displayed in Proteopedia as well. On Proteopedia pages titled with a PDB code, click "show" in the blue Evolutionary Conservation bar below the molecule. If you run your own customized ConSurf job, follow these instructions to display your result from a green link in Proteopedia. 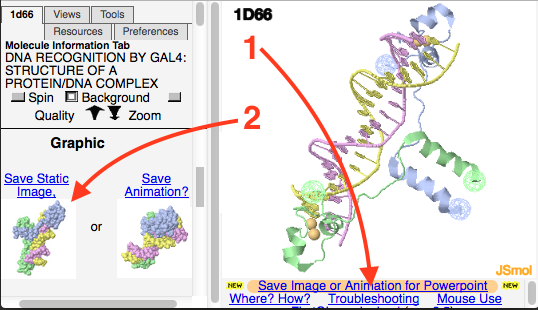 If you prefer to create molecular scenes from scratch within Proteopedia, you can use its built-in Scene Authoring Tools. These are so easy that college students have used them successfully without any training.